Which of these is not a rose from my garden? The first three are roses (and I cheated as Jacqueline du Pré of course was a renowned cellist who had a rose named after her. 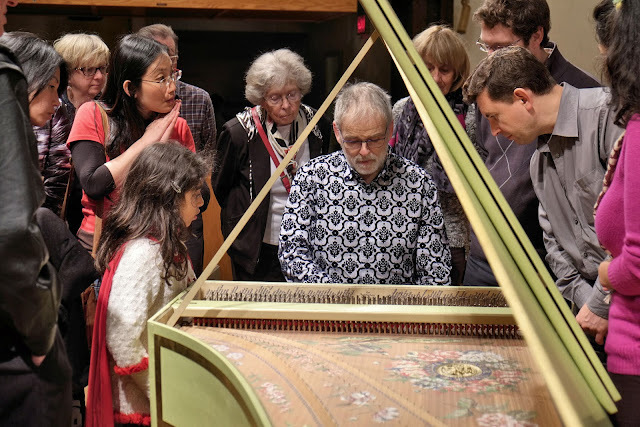 Listening to her Sonata No 2 in D major last night at a performance of the super-group La Modestine (and look here for the program) at St. Helen’s Anglican (not far from my Kitsilano home) was something like spotting a Russian car in the 70s anywhere. I would stop and marvel at its alieness and even looked at the metal surfaces as if they had come from afar in a meteorite. Listening to her Sonata was specifically not only a revelation but also because of Michael Jarvis’s playing on the harpsichord. The harpsichord is an instrument about which I have conflicting thoughts. When I listen to it with a mid-sized or large baroque orchestra I cannot hear it except in moments (the same for the lute). For me the harpsichord is like parsley in a soup. 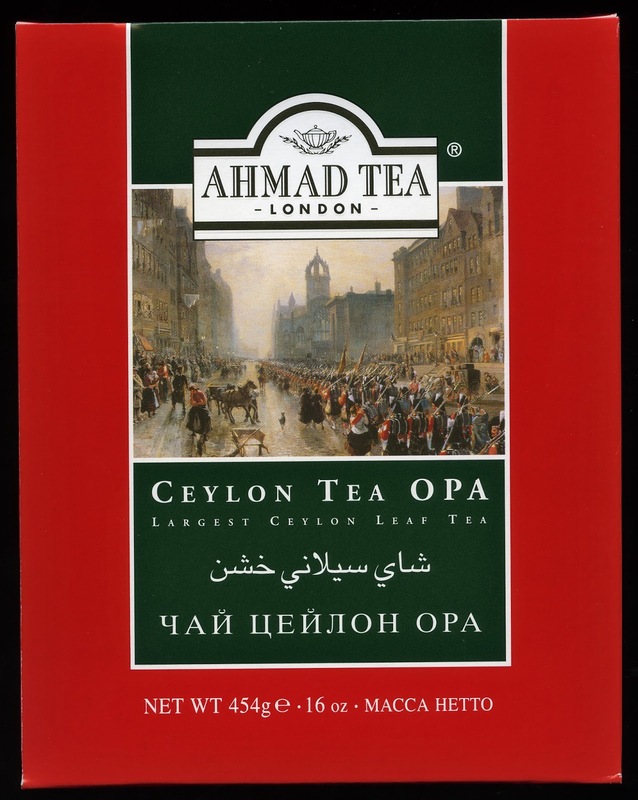 You know of its presence even though you might not discern its taste. 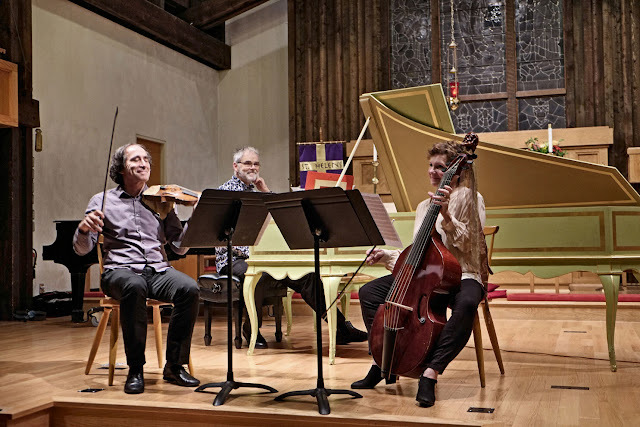 But in a La Modestine as a trio (the also play as a quartet with a second violinist Linda Melsted who cannot come from Seattle all the time) the harpsichord shines as an instrument. And it shone last night for two reasons. One was Michael Jarvis’s light but elegant touch and the other was knowing that Elisabeth-Claude was indeed a harpsichord player probably as elegant as Jarvis) who had played, as a teenager, for Louis the 14th. For the average Vancouver concert-goer the composers featured last night would have been virtually unknown except perhaps for Dietrich Buxtehude. The others, Jean-Fery Rebel, P.H. Erlebach, Jacques Duphly and Marin Marais would be question marks. But then the EMV (Early Music Vancouver) the Pacific Baroque Orchestra and several other groups including La Modestine are exploring the composers of the 17th century for our benefit. This is what makes early music composers in Vancouver seem like avant-garde new composers. This would be particularly true if you have never heard any of them. Particularly striking is watching Marc Destrubé play. He cannot hide his emotions and he would certainly lose his shirt in strip poker. But what is surprising in the 21st century that except for the Erlebach Sonata all available on YouTube! I will put the links below. The concert ended with three pieces. 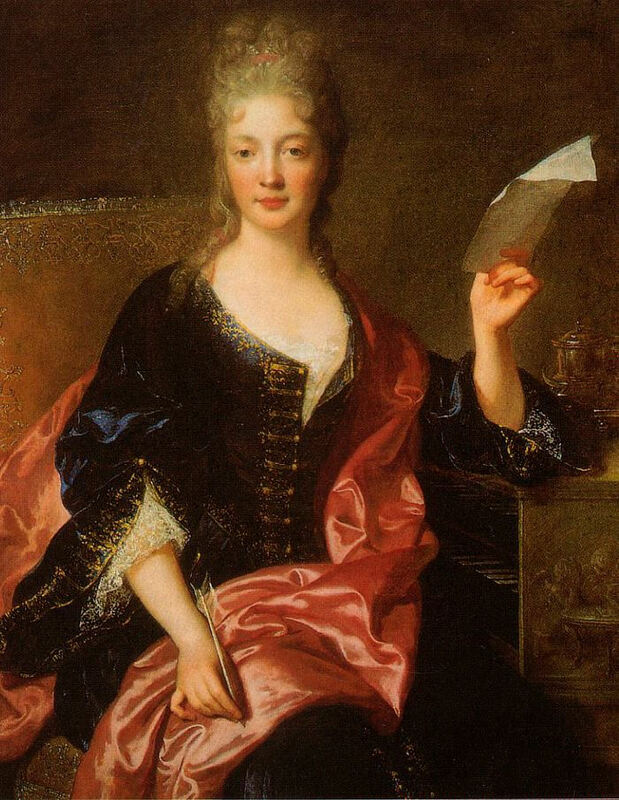 The first was a harpsichord solo (with wonderful use of the keyboard in the lower register) Jacques Duphly’s La Forqueray (which means “the proud one in the feminine gender!”. I am warming up to that solo harpsichord these days. The second piece was Buxtehude’s Sonata in A minor Bux 272 which featured a second movement Adagio that was so lovely that I was in tears. Perhaps it was all about a cold rainy and depressing Friday evening, perhaps not. I was lifted from my doldrums by Marin Marais Sonnerie de Ste. Genevieve du Mont de Paris. This sonnerie was a virtuso piece for Mackie's viola da gamba. The Sonnerie was like a march song in which I felt like a French soldier ready to meet my maker by shooting the English in battle. To me the piece sounded suspiciously like a Chaconne. Marc Destrubé said it was not and Natalie Mackie told me, “I disagree,” but then I know that Natalié Mackie’s email contains the word chaconne! There was a large contingent of visiting Iranians who had never seen a harspichord or listened to a baroque concert. I had a nice time explaining to some of them (as best I could) that Natalie Mackie's viola de gamba was related to the guitar and not to the cello or bass. Many flocked around Michael Jarvis and they oohed and aahed at his string instrument (so it is Jarvis told me) and listened to his explanations. For info on Müze West concerts at St Helen's Anglcan look here. Robert Louis Stevenson, the consumptive young Scottish writer who later became famous for “Treasure Island” and “Kidnapped”, walked through the Cévennes with his donkey Modestine in the autumn of 1878. 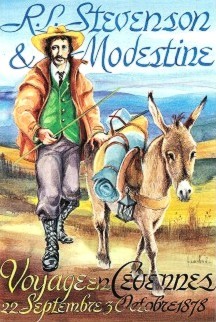 Although he was a sociable soul, he preferred to walk alone, because “you must have your own pace, and neither trot alongside a champion walker, nor mince in time with a girl”, and in order to “surrender himself to that fine intoxication that comes from much motion in the open air, that begins in a sort of dazzle and sluggishness in the brain, and ends in a peace that passes comprehension”. At age 74 I find that I am attracted to intimate dance, intimate music, small intimate novels, and plays that feature one or very few actors. The idea of going to a large performance at the Orpheum or the Chan Centre of the Arts is becoming anathema to my soul. For many years Vancouverites have complained about our dearth of venues for performance. I beg to differ and I wrote this. And yet in this 21st century the idea of a large symphony orchestra is becoming financially untenable. The Vancouver Symphony Orchestra may be one of the few (I believe) that has hired musicians full-time and not on contract so they may be beneficiaries of coveted dental plans. Of late I wonder about such venues as the Queen Elizabeth Theatre and its neighbouring Vancouver Playhouse. How often in one year do they have people warming the seats? With the Playhouse Theatre Company gone what else happens at the Playhouse? I have been to Arts Umbrella Dance Company finales and to smallish baroque group concerts sponsored by Early MusicVancouver. The Turning Point Ensemble plays in the smallish (but slightly claustrophobic) venue in Simon Fraser's downtown campus. The concerts feature the avant-garde and works rarely played in Vancouver like Duke Ellington's symphonic works. This year how about Frank Zappa and Edgar Varese? A very small venue is the Gold Saucer Studio in the Dominion Building. On Seymour Street right next to the Orpheum is the Orpheum Annex and Pyatt Hall. Both offer the latest in acoustics in a compact size. I am attending one concert this coming Saturday at the Annex. Read about the program here. But dear to my heart is the idea of going to a small church, not far from my Kitsilano home. In today’s case it is La Modestine at St. Helen’s Anglican Church featuring the sometimes trio and sometimes quartet La Modestine. The performers as I wrote her are absolutely first class. 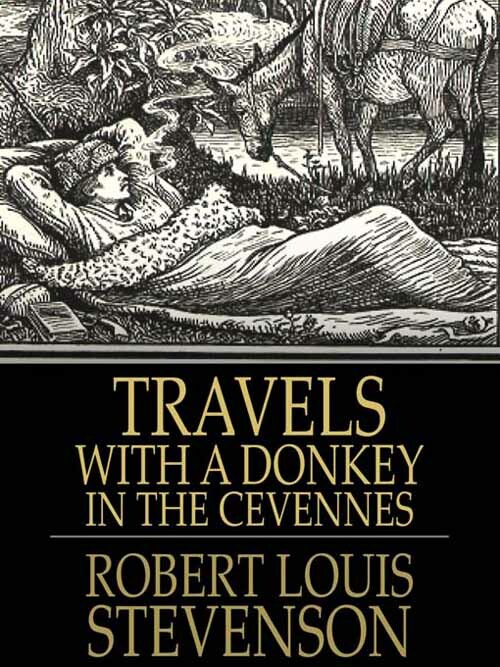 I find it paradoxical that they have chosen as a name Robert Louis Stevenson’s donkey Modestine from one of his first works, Travels With a Donkey in the Cevennes. From the above citation of the book that I found here, it says that Stevenson while sociable preferred to walk alone (or with a donkey). It is paradoxical because La Modestine’s musicians are particularly attracted to the idea of the fun of performing together. 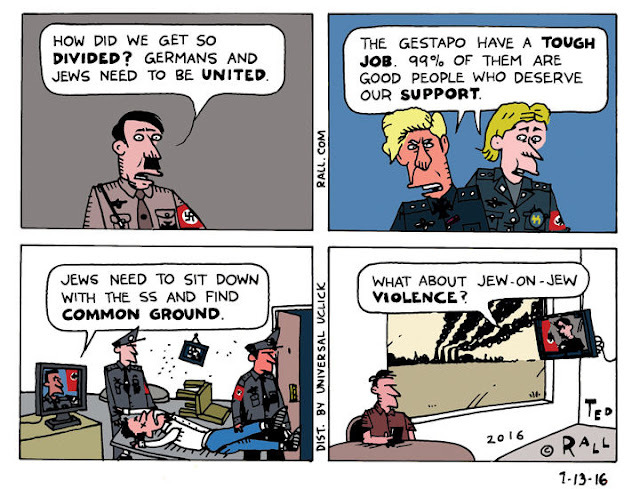 I have had two favourite editorial cartoonists in my life. One of them was the very Mexican Abel Quezada. I wrote about him here and here. The other cartoonist that I really like is a very left-wing American called Ted Rall. 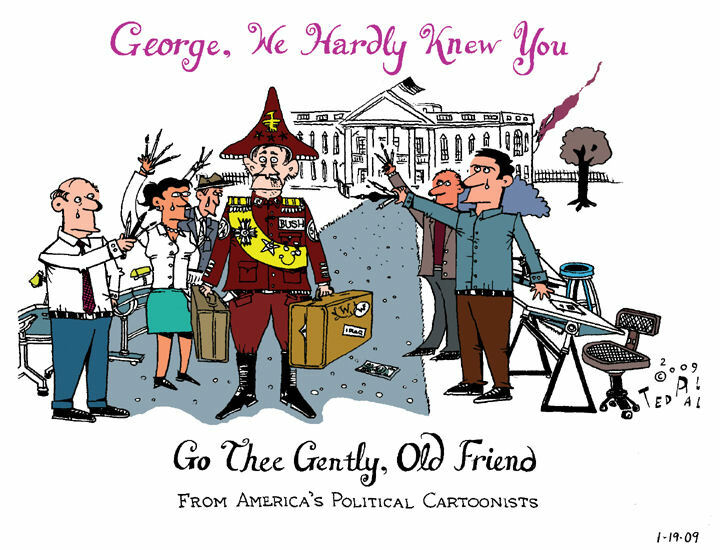 While he is a syndicated cartoonist and writer I see his stuff on my on-line Washington Post. He is a delight. As an Argentine who served in the Marina de Guerra in the mid 60s I know what it is like to live in a country where the next rank up of a four star general is President of the Republic usually via a coup d’état. In fact I participated in one (I obeyed orders or I would have been shot!) where our freely and honestly elected president (a gentle country doctor) Arturo Illía whose term that began on October 12, 1963 and ended abruptly (but gently as he went home in a taxi) on June 28, 1966. I was with a contingent of the army, air force and the nave that surrounded the Casa Rosada and gave him on hour to leave. In another previous cop attempt I remember being in the grandstands of the River Plate football stadium watching a game. We heard some rumbling and we saw a long string of tanks going into the city. We all ignored the event and went back to watching the game. Thus with the latest pronouncements by Donald Trump on perhaps not accepting the results of the November 8 elections and of his backers taking the streets to stop a possible inaugural of Hillary Clinton I find myself in a world of magic realism North of the equator. And when Trump says he would like to have his presidency decreed I hyperventilate. But my fave cartoonist Ted Rall foresaw this years ago during George W. Bush’s presidency. 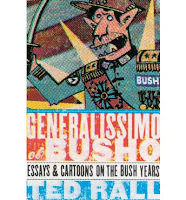 He featured Bush as El Busho (as a wolf, perhaps?) who with his epaulets (huevos fritos or fried eggs in my native Argentina) looked like the very image of any South American military dictator that ever was. Rall’s cartoons may offend some but I believe that this is a good thing. It is unfortunate that our own Vancouver Sun and other Canadian newspapers have never discovered him. But I must point out that I loved Len Norris. The idea of this blog has given me a week-long insomnia as I wrestled in my mind about writing it. I believe that with the fall of journalism, particularly in Vancouver the lofty job of arts publicist is in the imminent process of extinction. Last week it was about the demise of the arts critic. In the 20th century when rock records were at their apogee local record company reps were the kings of the block. They could at a whim deny any access to their visiting stars to any arts or newspaper publication that did not play by their rules. During my long stint as photographer for Vancouver Magazine I worked with rock writer Les Wiseman whose credibility was so good that record reps granted us access (particularly for back-stage interviews with their corresponding photo sessions) to almost everything. As records became second fiddles to CDs and with the advent of digital recordings record companies and their reps lost their importance. As a member of the board of the Pacific Baroque Orchestra in the late 90s I once called up CBC Radio Arts Reporter Paul Grant on a Wednesday with the following tease, “How would you like to interview a grown baritone who sings in falsetto?” He nicely and graciously took the bait. He interviewed countertenor Matthew White (now Executive and Artistic Director of Early MusicVancouver) on the Thursday. The interview was aired Friday morning and the Friday night concert sold out. This sort of thing would be impossible now as the CBC in Vancouver no longer has a a reporter dedicated to the arts. Representing several local publications as an assigned photographer I dealt with many arts publicists. 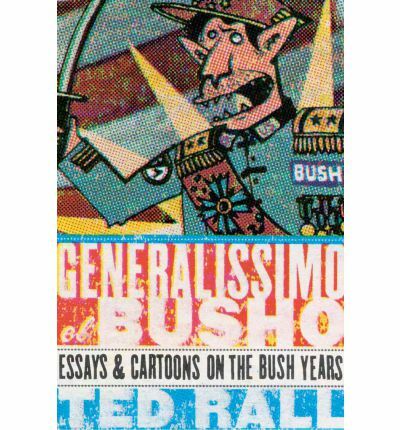 In that 20th century any decent arts organization had a full-time publicist who was savvy. The most savvy of them all was Vancouver Opera publicist Doug Tuck. He was never pushy. He was urbane, knowledgeable and inventive. 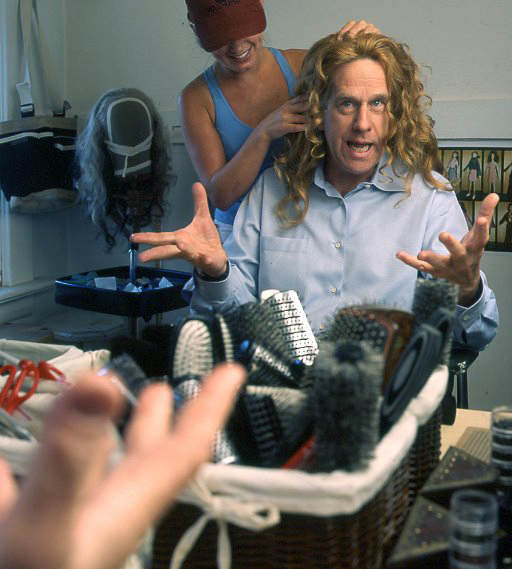 When I had to photograph an opera star he arranged for makeup and wigs just for me. As a pre-opera commentator he was the best. What I was never able to tell him is that he got covers and articles in publications because editors and arts editors like him. For me the retraction of the season of the Vancouver Opera into the present began when they promoted Tuck to marketing and starting hired free-lance publicists. How did film company’s promote their films in that 20th century? Film writers and film critics were sent on junkets (that’s the word!) to La and put up in the best hotels. Press conferences where planned in large hotel rooms where the writers sat near the film star or director. They all placed their recorders on a central table. Writers shot their questions. Local Vancouver writers then wrote essays that were supposed to be exclusive interviews. With the advent of cheap phone communications and the internet/email interview the glorious junkets all but disappeared. One version of it still survives in Vancouver. An editor or good writer, as an example, is sent to South Africa (First Class naturally) by let’s say the De Beers Group in South Africa to interview company principals. De Beers provides the magazine with first class photographs. Then the magazine publishes a lovely and wonderful “article” about the diamond industry. In the 80s and 90s magazine or newspaper articles that were hidden adds were called service pieces. 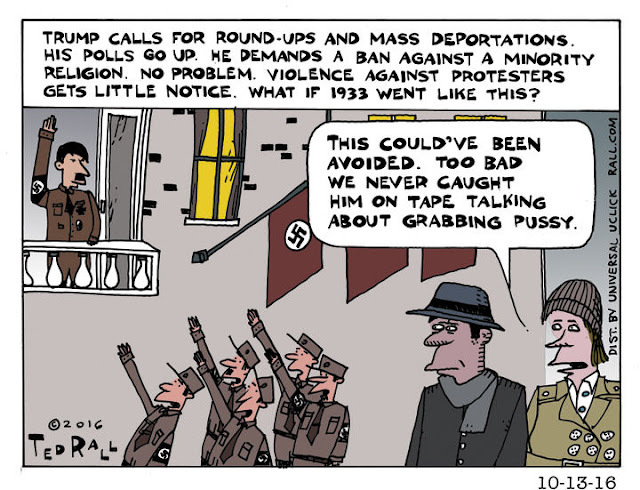 A new variation appeared in the Wednesday October 26 Vancouver Sun. In its first section it boast four full-page section on interior design “sponsored by the likes of Inspiration Furniture, Jag’s Furniture & Mattress and La-Z-Boy. In this dying attempt to keep paper with ink my wife tells me that she refuses to read the local arts weekly because of the jumble of ads. Clean design disappeared years ago. This finally brings me back to the publicist. Let us say you are a publicist at a theatre company and you are full-time. What do you do? As a frequent contributor to Vancouver Magazine, the Georgia Straight and several business magazines in that dawn of things digital I personally saw editors like Vancouver Magazine’s Malcolm Parry chuck into the waste basket the countless press releases that were mailed to the magazine. Imagine what happens to emailed press releases. The publicist might attempt to communicate with overworked arts editors or with publications that do not have such a thing. Then the publicist if indeed a yes has been received is faced with the unwritten fact that if a publication does a preview they will not do a review (or the opposite). And if you count the fact that you might have around 3½ publications that mention the arts (the Vancouver Sun on Wednesdays exclusively features food as “the arts” attempting to fill seats in a concert hall is a tough proposition. So what how do arts organizations survive in our Vancouver? Consider this: You go to an Early Music Vancouver concert. In the venue lobby you are handed a program that includes a little sheet of paper where you are asked to write your name, phone number (and very important you are asked for your e-mail). You are told that there will be a draw before the concert begins where you might win two tickets for upcoming concerts. The purpose of the above is to enlarge their base of would-be concert goer’s base. This is what now helps to fill seats in Vancouver. Because it is the responsibility of artists and art organizations to call up city publications to inform them of coming events (very little chance that that a press release might have then call you) artists have found that the best way to promote upcoming concerts, dance performances and small theatrical productions is via their email base. I am on the e-mail list of Turning Point Ensemble, ColinMacDonald, Marina Hasselberg, Early Music Vancouver, the Pacific BaroqueOrchestra, John Oliver, Vancouver Symphony/Jocelyn Morlock, La Modestine/MarcDestrubé , the Microcosmos Quartet and many more. Plus many churches including St.Philip's Anglican in the Dunbar area have very good musical programs. I never miss anything. Plus every year the UBC School of Music mails me their season’s brochure of concerts especially the noon ones. SATURDAY, OCTOBER 29th at 8 p.m.
Once again Yarilo is offering intriguing new, and unexpected musical ideas! This time we will take you on a path of musical freedom - unrestricted, unpredicted! Together with the Colin MacDonald Pocket Orchestra and ProArte Ballet Company we will follow on the steps of Francis Picabia, one of the fathers of the Dada movement who said: "My mind depends on rhythm, dance, movement" and we will play, dance with rhythm and movement! Our "Jack in the Box" is a musical journey back in time in which we re-envision the atmosphere of some of history’s entertainment hotspots. We will begin in the smoky cafes of turn of the century Paris in the heady days of Toulouse Lautrec, Cancan girls and the music of Erik Satie. The “Grande ritornelle” from Satie’s “La Belle Excentrique” serves as a promenade as we dance our way from Paris with Satie’s ballet “Jack-in-the-Box” to the early cinema and Michael Baker’s “Phantom of the Dance,” a musical retelling of the silent film classic. Dance is the common theme as we move next to a public square for a moving celebration in an Eastern European village with a new commission by Colin MacDonald. Finally, we cross the globe to revisit the clubs of New York and Los Angeles during the Swing Era, with a performance of Igor Stravinsky’s jazz classic, “Ebony Concerto.” Satie provides our musical guide on route. Performers: Jane Hayes and Anna Levy - pianos; François Houle - clarinet; Colin MacDonald Pocket Orchestra; ProArte Ballet Company. What do publicists do besides twirling their thumbs? ¡Siquiti Bula a La Bim Bom Bam! Living in our Kitsilano home on 7th and Trutch has us near just about the best walking/shopping experience in town. 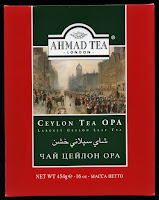 I no longer have to drive to Commercial to get my Ahmad Tea. I get it (I have 10 varieties) at Persian Foods on Broadway just west of MacDonald. But I do go to Commercial to buy my good cheeses at Bossa. But best is Young Brothers Produce just a around the corner from our house. The nicest surprise in our walk today was finding this neat tortilla warmer at Fresh is Best – Salsa & Company where we buy our freshly made (in Burnaby) tortillas and my favourite hot sauces. When we left Mexico City in 1975 in our VW bug journey to settle in Vancouver the most useful kitchen accessory was our gas stove. A gas stove is where most Mexicans heat their tortillas or singe their Poblano peppers. In most of our years in Vancouver the Poblano pepper problem was not a problem as Poblanos were not available. I am happy to report that our Safeway on MacDonald and Broadway has been stocking Poblanos to my delight. The problem was heating tortillas. Some 15 years ago our eldest daughter gave us a brand new microwave. At first I avoided using it until I discovered that microwaves were made for two important uses. One was to heat tortillas (particularly if you use Mexican tortilla warmers) and the other to re-heat my large mugs of tea. Subsequently I learned to pierce potatoes with a fork, microwave them for 9 minutes on high and then finish them off in a hot oven. Purists might not agree but I steam my corn on the cob and asparagus in the microwave and I have no complaints. It is a paradox of sorts that our eldest daughter Ale (who gave us that first microwave) does not “believe” in them. I have no idea how she is going to warm up her tortillas (she was born in Mexico and feels very Mexican). 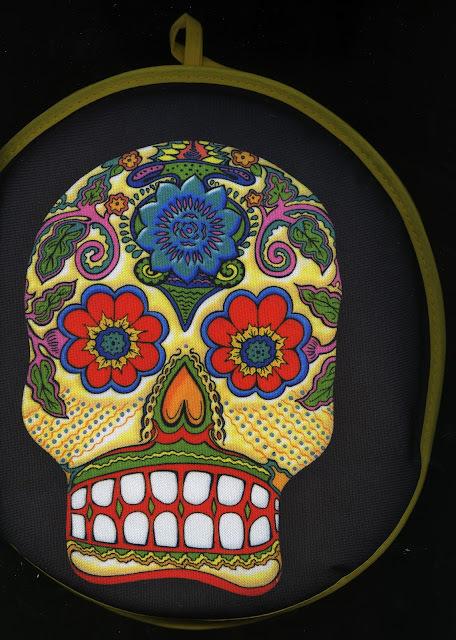 But I like the skull and I am sure that she will love it. And I can only add here that I am so glad we are near Fresh is Best and every time I enter the store I discover some new item from my Mexican past. Link to: ¡Siquiti Bula a La Bim Bom Bam!